Turrall Fly Pod River Dry Selection, this selection of dries givers the river angler enough patterns for the entire season. It includes specific imitations such as the March Brown, Black Gnat and Yellow May Dun and also general representations such as the Greenwell's Glory and Klinkhammer. 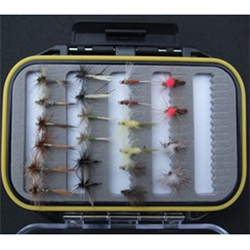 Turrall Fly Pod River Dry Selection contains 22 flies 11 patterns. Turrall Fly Pods, a choice of over 30 selections of award Winning Flies. The Turrall Fly Pod internal measurements are 10cm x 6cm and it is waterproof with a see through lid on both sides, giving you plenty of room to expand your fly collection. The Fly Pod can be purchased separately without flies.